The Independent Manchester Beer Convention (IMBC) is the highlight of UK beer festivals for me. In the same way that some people love Christmas - I count down the days until IMBC and the closer it gets the more excitable I become. Part of it is simply escaping London for a few days but part of it is that I have a soft spot for Manchester. In the early 1990s, when I was in my early teens, I used to visit my sister who was at university there and I have fond memories of trudging up and down Oxford Road in my DMs either heading out for the night or scuttling home in the early hours. In my mind Manchester has always been closely associated with good times involving beer and laughter. In much the same way that a city can be so central to a story so as to effectively become one of the characters in a book, the venue for IMBC is one of the most important features of the festival for me. It is a pleasure and an honour to be able to spend time in such a beautiful location as Victoria Baths. To contrast it with a venue like Olympia (used for GBBF) which is effectively a giant box, is like comparing a lump of wood to a diamond. As well as three large rooms, the baths has outdoor space and a warren of smaller rooms, plus the upper levels which are fantastic for people watching. 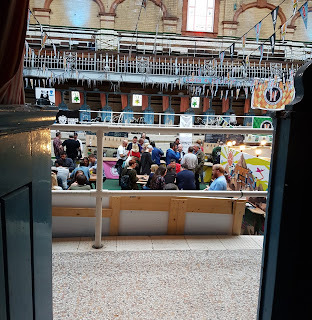 But my favourite feature has to be the rows of little changing cubicles in rooms 1 and 3 where you can take a secluded seat behind a curtain or door and enjoy some time out, away from the tidal flow of festival goers. If you spot someone you want to talk to you can just throw out an arm and catch them as they pass by. It makes me happy just to sit on my own with a beer and take in my surroundings. Call me easily pleased, but I'm not sure what other entertainment is really required from a beer festival. Who Needs a Beer List Anyway? A couple of years back we all loved sitting there with our pastel-coloured beer lists and our IMBC pencils, circling the beers we wanted to drink. The lists were reasonably accurate but sometimes beers would run out, or never arrive in the first place, and beers might not appear at the specific session they were slated for. I can understand that it's impossible to know in advance which beers which will be finished in a single session so the 'fluidity' of the beer list was never a serious problem to me. This year there was no hard copy of the beer list available to punters, instead we had an app. We are all so used to checking our phones for information rather than a piece of paper that it seems reasonable to do away with the beer list, doesn't it? I confess I didn't even look at the app before I got there. In fact I only looked at it twice while I was there and one of those times was in an attempt to inspire myself to physically get up and go into another room. But it seemed like a functional app to me and I didn't hear any complaints about it while I was there. But I have a confession to make. The beer list isn't really my priority at IMBC. To provide some context - if I go out for a beer and a bar has one of my favourite beers on (e.g. Cannonball, Axe Edge, or a Kernel pale ale) I'll happily drink that same beer all night. I'm not fussed about ticking and I'm rubbish at checking beers into Untappd. There's a multitude of reasons for that (enough for a post in its own right) but the key point is: I'm not hunting for novelty or trying to get a high score. What I did at IMBC for the most part was drink beers that I was already excited about: the aforementioned Kernel pale and IPA, Burning Sky Cuvee, Buxton's crazy ice cream beers. But I'll admit that I'm also keen on a well-made DIPA. I know what I like and I'm quite fussy about it. I'm not even talking about faults here (although I'll admit I did drink one poorly made DIPA while I was at IMBC which I was unable to finish), I'm talking about design and technique. There's more than one way to brew a great DIPA but not all of them will produce beers that I would choose to drink. For example, I love Other Half beers (that's why I volunteered to pour their beers at two UK beer festivals this year) and I know what to expect from them. But I think that at IMBC I had maybe three OH beers over the whole festival, even though they probably had four times that number available over the weekend. That's because I wasn't at IMBC to drink as many different beers as humanly possible, even if they are amazing beers which I would I know I'd enjoy. So if the beer is not that important then what is? Well, I already explained how important the venue is to me. But the other key ingredient is the social element of IBMC. It seems like it is impossible to go more than a few yards without bumping into a friend or acquaintance, or spotting them from across the room or whilst looking down from above. It's also great to see friends of ours who started out as homebrewers now pouring their own beers at IMBC (e.g. Elusive, Torrside, Affinity). We are pleased and proud for them. There are always loads of people we want to catch up with at the festival. In too many cases this gets limited to a quick 'hey, how are you?' - because one or both parties are already in the process of going somewhere else to do something else at the time. But there's another reason we don't manage to chat to as many people for as long as we'd like to and that's because I have a problem with extended social interaction. If it goes on for too long without a break I find myself completely drained of energy. I feel physically and mentally worn out. I experience the same effect after teaching or tutoring, or doing voluntary work/public speaking, or working behind the bar. I enjoy all of these activities and I am good at them - otherwise I wouldn't do them - but I really do need to unwind and decompress afterwards. As an introvert I need to put a bit of effort into performing and the energy I expend in being 'switched on' requires me recharge my batteries when I'm done. Luckily, this is as simple as sitting on the sofa without having to interact with anyone for a couple of hours. In the first couple of sessions at IMBC I have a great deal of enthusiasm for interaction with people. But as time passes that energy wanes and I begin to feel too 'tired' to cope with any extended conversations. Hopefully, I haven't offended anyone I like and actually wanted to talk to with my fatigued demeanour. I am aware that sometimes a hangover can manifest itself as a kind of existential dread which brings with it an awful anxiety. I won't deny that I've been there a few times. But I have to say that I didn't have a single IMBC-related hangover this year, which is probably the one thing which made it clear to me that I have an issue with extended socialising that isn't directly caused by the effects of alcohol. I also want to be clear that I don't think I suffer from social anxiety disorder. I would describe myself as shy, antisocial and introverted. None of these things stops me from being a friendly social person when I have the energy or desire to be so. But the trouble is that I don't always have that energy available. This year's experience has been a bit of an eye-opener for me in terms of self-awareness. I need to learn my own limits. As much as I love, you IndyMan, it might be that attending all six sessions isn't the best thing for my mental health. It's not you, it's me. Honestly.